Transitioning your favorite summer outfits into the cooler days of fall can often be quite difficult, but, as long as you have a couple of pairs of leggings, you should not have a problem. Leggings are extremely versatile, and are ideal for providing you with that extra bit of coverage and warmth, without detracting too much from the essence of your summery look. Summer slip dresses can be slightly tricky to style for fall, but leggings make this so much easier. Simply wear a button-down shirt underneath your dress, and then a pair of leggings underneath. Pair this with some heeled ankle boots, as well as a pair of sunglasses to finish off the look. Denim jackets are perfect for the cooler fall months, and, whether you opt for a longer or a cropped style, they work so well with leggings. Depending on how heavy your jacket is, you could wear just a tank top underneath, or a short sleeved summer t-shirt. If the day turns particularly warm, simply tie your denim jacket around your waist for a laid back, casual look. If you have some summer tops that you usually wear with shorts, try pairing them with some leggings instead. Then, all you need to do is add a sweatshirt or a cardigan, and you are good to go. If you have opted for a summer crop top, try finding a cropped sweatshirt to wear with this, as this should give you enough coverage to ensure that you do not feel cold with your bare stomach. A black tailored blazer paired with some black leggings is beautifully chic, and works well with just a plain white t-shirt underneath. This look can be worn with some sneakers for the daytime, or with some heels for the evening, making it a fantastic transitional outfit if you need to quickly and easily go from day to night. Do not forget to bring along a spare bag too, as a large black leather bucket bag would be great for the day, whereas a smaller, colorful, clutch bag would add an extra stylish touch to an evening outfit. While full-length leggings tend to be most popular, cropped leggings are a great alternative, especially for fall. These allow you to reap all of the benefits of leggings, but still show a little bit of skin, which is always great before you need to cover up for the cold winter months. An oversized scarf can really give you a surprising amount of warmth, meaning that you can still wear your flowy summer tops well into fall. Simply pair this with an oversized scarf and some sunglasses, and you will have an outfit that is perfect for a sunny fall day. One of the main advantages to leggings is that they are so incredibly versatile, and can be styled in ways that allow you to wear them just about anywhere. Whether you pair them with your favorite summer dress, or with a t-shirt and a sweatshirt, these outfits are perfect for transitioning you to the next season. Each season brings with it exciting new trends, and this fall is no exception, especially when it comes to footwear. From flats to block heels, these are the styles that you need to be keeping an eye out for this upcoming season. In addition to being easier than thin, stiletto heels to walk in, block heels are also much better for the health of your feet, making them a trend that many women will welcome in this fall. While block heels were featured on quite a few shoe styles, they were most prevalent on ankle boots, making them shoes that you will be able to wear through the winter too. To allow your shoes to really make a statement, opt for a pair that boasts a more unique and interesting style, such as one that has been decorated with studs, or crafted from a richly colored velvet. Boots are often back on trend when fall rolls around, but, this season, it is slouchy boots that have really made their mark in the fashion industry. These boots are tall, but are quite slouchy around the ankles, and promise to instantly bring your wardrobe into the new season. Rather than traditional loafers, the loafers that you will be seeing everywhere this fall are more of a hybrid style, as they look as though they have been crossed with slides. These shoes are so convenient, as they are a slip-on style and do not feature any buckles or straps while being just as comfortable as a pair of slippers. These are best worn with cropped pants or dark denim, and should also be worn with bare feet, as socks will only make your whole outfit appear cluttered and chunky. If you are only going to invest in one new pair of shoes this fall, let that be red ankle boots, as these were seen on just about every fall 2017 runway. Red is a bold color that exudes confidence and will give your fall outfits an instant update. When it comes to the heel, block heels are best to go for, as mentioned above, and this is also quite a classic heel, meaning that you are likely going to be able to wear these boots for years to come. Whether you love them or hate them, cowboy boots have been making quite an appearance on fashion runways, and are set to be a big trend this fall. While many designers styled their clothing with cowboy boots, it was the Calvin Klein runway that really stood out, as the boots here were styled in a casual but chic way, worn underneath track pants. Purchasing a pair of on-trend shoes is a quick and easy way to give your whole wardrobe an update for the upcoming season, as your shoes can have a huge impact on the rest of your outfit. From red ankle boots to slide-on loafers, these are the top trends to keep in mind the next time you are out shopping for footwear. Working out whether or not the man you are interested in finds you sexually attractive can sometimes be difficult, especially if he is giving you mixed signals. However, a recent study carried out by the University of Kansas has managed to pinpoint certain signs that you can keep an eye out for, so that you can know once and for all whether or not he just wants to be friends. While the study carried out by the University of Kansas showed that men who look at a woman’s head could potentially be considering her as a romantic partner, staring at the face for an extended period of time could actually mean that they are less interested in you than you think. However, if his gaze keeps falling to your chest and hip regions, this does show a romantic interest, and correlates with past research that states that this is an evolutionary response to the way in which a woman is able to reproduce. While a potential love interest looking at your chest and hips could be a good sign, this is not the case if he keeps glancing towards your feet and legs instead. Researchers believe that this is a firm sign that he considers you to be just a friend, so do keep a look out for his eye movements. A man’s posture and proximity in relation to you can tell you quite a bit about his feelings towards you. A man who wants to be more than friends with you would lean into you during conversations, and try to stand quite close to you, finding excuses to place his hand on your shoulder. However, if you have not noticed any of this happening, and he has the same posture and proximity to you as he does his other friends, then it is likely that he also classifies you as a friend, rather than more. In addition to looking out for physical signs that he wants to be friends, there are many others that you can keep an eye out for too. If the man you are interested in rarely initiates the conversation with you, and it is always you that has to start it, this is a sign that he does not have romantic feelings for you. It likely means that he is happy to chat to you here and there, just like he would be with his other friends. If he was interested in you romantically, he would be more likely to frequently initiate conversations with you, as he would want to speak to you much more often. While it can be difficult deciding whether someone has romantic feelings for you or not, there are certain signs that you can look out for. From his eye movements to his posture, keep all of these tips in mind the next time you are spending time with that potential special someone. As people age, they tend to slow down a bit and take life a little easier, but this can actually have quite a detrimental effect on your overall health, as it causes a decrease in metabolism and therefore muscle mass. Studies have shown that a significant chunk of the population do little to no exercise after the age of 50, and this is something that really does need to change. For people who are generally quite sedentary, the best way to begin making positive fitness changes in your life is by introducing a physically activity that you genuinely enjoy. This can be anything from walking the dog to taking a sunset stroll after dinner to going dancing a couple of times a week. Starting off slow will help to gradually increase your fitness levels, which will then make other fitness activities seem far less daunting. Bone density peaks around the age of 30, and after this begins to slowly drop, which is why strength training is so important, as this will give you the strong bones that you need to keep your body healthy. Strength training basically refers to lifting heavy objects, and should be carried out around two to three times a week in order to really build muscle strength and mass. Lifting weights is the best way to do this, and you should try to begin with dumbbells that weigh between five to eight pounds, increasing this to eight to ten pounds as your body gets stronger. While you may have been able to build up strong muscles in just a few weeks while you were in your 20’s, you need to be realistic about the fact that this is going to take a bit longer now that you are over the age of 50. Make sure that you allow for this when coming up with your fitness goals, while also taking into account that your body will need more recovery time after intense workouts. Patience and consistency are key here, and while the results may take longer to appear, working out regularly will end up giving you the stronger body that you desire. Many people believe that activities such as high impact aerobics, which work the same muscles over and over again, is beneficial, but this is actually a sure-fire way to cause an injury to your body. Cross training makes use of several different types of fitness activities in one session, resulting in a far more balanced workout that prevents injuries from occurring. There are many different types of chronic diseases that commonly affect people who are 50 and over, from heart disease to diabetes to osteoporosis, and your chances of developing one of these increases drastically if you are generally quite inactive. However, keeping fit and exercising on a regular basis is one of the best ways to prevent these diseases from occurring, while keeping your body healthy and strong as it continues to age. Maxi dresses are synonymous with the summer months, but there is no reason why you have to put your favorite maxi dresses away once fall rolls around. By keeping these styling tips in mind, you will be able to rock your maxi dress well into the autumn months, and even into the start of winter. Once the end of summer rolls around, you are likely to want a bit of extra warmth, but will still want to show some skin. This is where a vest comes in, as this can be worn over your maxi dress but left open, meaning that your whole dress is still on show, but the upper half of your body will have some extra coverage. While a vest works best with a maxi dress with sleeves, you would still be able to pull this look off with a sleeveless dress, although you may need to be more careful with the accessories you choose. Layering your maxi dress with a light sweater and a pair of ankle boots is a great way to take it into the months of fall. If your sweater makes the whole outfit appear too bulky, try cinching in the waist of your maxi dress with a skinny belt, as this will really flatter your figure. Scarves are perfect for giving your body that extra bit of warmth, and can also add a completely new dimension to your maxi dress. As a general rule of thumb, try to opt for a solid colored scarf if your maxi dress features prints, or a printed scarf if your maxi dress is a solid color, as you want the two to work together rather than compete with each other. The shorter length of a cropped jacket is perfect for accentuating a maxi dress, while giving you some extra coverage at the same time. A cropped denim jacket is a classic way to go if you are seeking out a more casual vibe, while those who are after something slightly dressier may want to opt for a cropped leather or military-style jacket. Layering your maxi dress with a shirt underneath will help to keep you warmer, while really adding a sense of personal style to your outfit. A t-shirt is all you would need for those warmer days, while a turtle-neck may be a better option if it is quite chilly outside. A maxi dress can quickly be transformed into a maxi skirt, giving you a whole new item of clothing to play with in your wardrobe. All you need to do is wear a blouse or a sweater over the top of your dress, leaving just the bottom half showing. While wearing a maxi dress in the fall does take a bit more effort and thought than it does in the winter, you will no doubt be able to put together some stunning outfits for the cooler months. Whether you pair your dress with a scarf and a cropped jacket, or layer it up with a shirt, do not be afraid to experiment when it comes to creating new looks with your maxi dresses. Turmeric is an ingredient that originates from South India, but has recently been receiving worldwide recognition for all of the health benefits that it brings. From easing arthritis to preventing cancer, here are a few easy ways to increase your intake of this superfood. Golden milk is one of the most effective ways to take turmeric, and only takes a few minutes to make. Simply mix some turmeric and ginger in with milk, and then bring this to a boil. Turn off the heat, leave to cool, and then add a small amount of raw honey to sweeten it. If you plan on drinking the golden milk before bed, as this is fantastic for promoting quality sleep, also add in a bit of nutmeg, cinnamon, and cardamom, as these help to magnify the effects of the turmeric. Eggs are a food that are commonly eaten for breakfast, and are great at disguising the taste of turmeric. Since egg dishes tend to mostly be yellow, this also hides the color of the turmeric, making it great for fussy eaters. When cooking the eggs, try to use coconut oil if possible, as this will bring its own set of health benefits with it. If you would prefer to consume turmeric in its freshest state, try seeing if you can purchase some turmeric root. This can then be juiced into your regular juices, although you will only need to use a thumb-sized piece of the root with each serving. Studies have shown that incorporating turmeric into a daily green smoothie can reduce inflammation in the body by up to 90%. Many people believe that turmeric can only really be used in curries and Indian dishes, but this is far from the truth. There are so many dishes that work well with turmeric in it, with the ingredient enhancing dishes such as carrot soups and lentil stews. You can also disguise turmeric well in rich tomato sauces, and then use this for everything from pasta to pizza. In addition to incorporating turmeric into your main meals, you can also try baking with it. There are many dessert recipes out there that include some turmeric, from scones to pound cakes, so have a look online to see what appeals to you the most. Golden paste, which is made from water, oil, turmeric and black pepper, makes the turmeric extremely bioavailable, making this the option to go for if you need quick results. However, many people find the taste of golden paste to be difficult to stomach, and would prefer to take it as a pill instead. Fortunately, this is easy to do yourself at home, requiring nothing but a pot of golden paste and some pill-shaped molds. Fill these molds with the golden paste and then freeze, taking them two to three times a day for best results. Turmeric is an ingredient that just about everybody could benefit from, as it boosts the health in so many different ways. Even if you do not personally enjoy the taste of turmeric, these tips will help you to incorporate more of it into your everyday life, in easy and tasty ways. 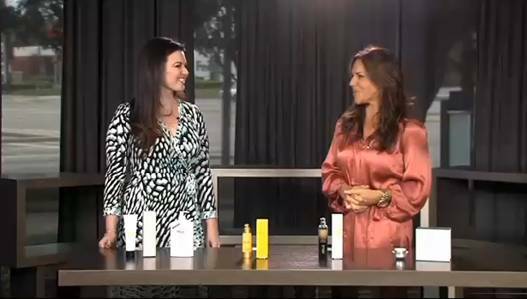 Nicole Gray, one of the most popular Beauty Experts in the country as well as the owner of “Kiss and Makeup” recently appeared on a local news station in the Dallas Texas area known as The Broadcast KTXD. Nicole is extremely passionate about helping women to look their beautiful best, particularly during those special moments in their lives. She believes that trust and understanding her clients are the key to being a good makeup artist. In her interview segment titled “Skin Care at Any Age”, Nicole explained exactly how the skin transforms from one form to the other as it ages. She also explained the need to alter the skin care routine as the skin ages. During this segment, Nicole specially mentioned the OROGOLD 24K Bio-Brightening Skin Tone Moisturizer as an ideal solution for women in their 50’s. She endorsed the moisturizer by stating that this OROGOLD product was extremely unique because it offered a lot of natural values to the skin. She also explained that there are cases where lesser amounts of makeup end up making the skin look younger. To further clarify the point that Nicole brought up during her interview, women in their 50’s need to take special care about their skin. As we age, we need to adapt our skin care routine to reduce the appearance of wrinkles and to keep our skin looking young and healthy. Once you reach your 50’s, your entire attention should be concentrated on maintaining the moisture content of your skin, protecting it from damage and trying to reduce skin care issues to a bare minimum. The Bio-Brightening Skin Tone Moisturizer doesn’t just help you to bring back your long lost radiance, it also helps you to look younger and healthier. This reduces the need for makeup and foundations, something which again goes on to improve the condition of your skin. When it comes to anything to do with skin care, OROGOLD has always prided itself in offering its customers with the very best and most unique products that not only take care of specific skin concerns, but also allow our customers to concentrate on timeless beauty. And with endorsements from renowned makeup artists like Nicole Gray, we believe that we are definitely on the right track.